Found as described, although under about an inch of soil and grass. First benchmark of the day. Found this one while driving along Skyline drive and enjoying the scenery. Main station and RM2 found. RM1 not found, despite a 30 minute search. 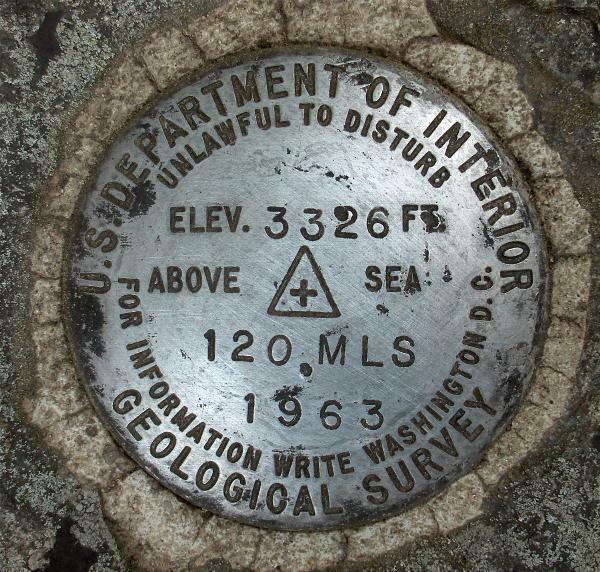 Nearby USGS Benchmark at Pinnacle Overlook. (3.2 Miles NE). There are not very many geocaches up on Skyland Drive so I though I would log a benchmark or two. This was the third of four. Please see the complete recovery, including text and photos, at my website: [b][url=http://surveymarks.planetzhanna.com/hw3272.shtml]HW3272 - THORO ERDL[/url][/b]. The location of the station is adequately described in the NGS Data Sheet. Easily found THORO ERDL RM 2 [DC4857] E of the current stone wall. Missed the other nearby reference mark. THORO ERDL AZ MK 2 [AI5756] is a separate log. Looked for THORO ERDL AZ MK 1 [DC4855] at Pinnacles Overlook. In the expected location, found a drill hole in a 3x6' rock that protrudes about 12". Also found bench mark disk 120 MLS in the same rock as the empty drill hole. No NGS Data Sheet exists for this station, but it is next in the series following 118 MLS [AI5759] at Crescent Rock Overlook and 119 MLS [AI5758] at Skyland Gift Shop. Searched again on 12-06-2006. Estimated the location of THORO ERDL RM 1 [DC4856] based on previously found disks plus a little analytic geometry. The wall may have been moved after the marks were set, and the 2x2' concrete slab was probably removed when the new footings were installed. Drill hole by keys may have been where THORO ERDL AZ MK 1 was set. Bench mark disk 120 MLS also set in the outcrop. The superimposed white arrow shows the expected location, less than two feet from the base of the wall. 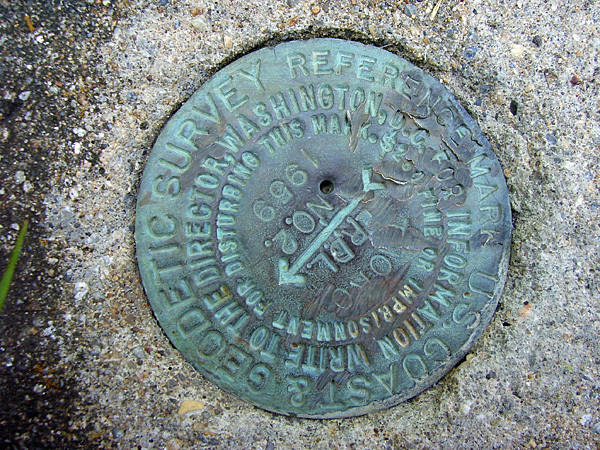 DESCRIBED BY COAST AND GEODETIC SURVEY 1959 (HRL) STATION IS LOCATED ABOUT 7 MILES EAST OF LURAY AND 9 MILES SOUTHWEST OF SPERRYVILLE. ON SKYLINE DRIVE AT THOROFARE MOUNTAIN OVERLOOK. 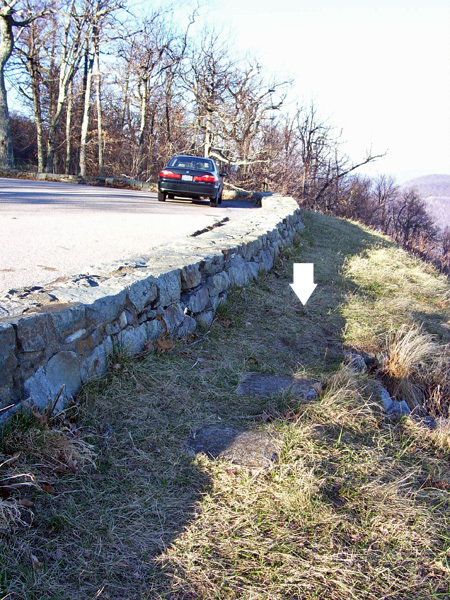 IT IS 24 FEET SOUTH OF THE NORTH CORNER OF A ROCK WALL, 54 FEET NORTH OF A THREE-FOOT OAK TREE, 3 FEET EAST OF A STONE WALL, AND 91 FEET EAST OF THE CENTERLINE OF SKYLINE DRIVE. 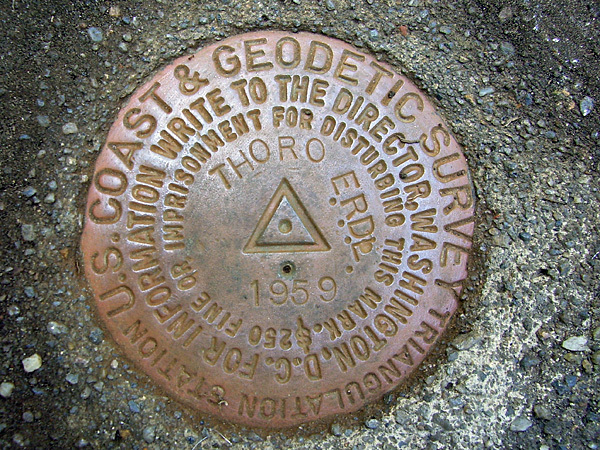 THE MARK, A STANDARD TRIANGULATION DISC THAT IS STAMPED, THORO ERDL 1959, IS SET IN A 12 BY 12 INCH CONCRETE POST THAT PROJECTS ABOUT 4 INCHES. THE STATION MAY BE REACHED FROM THE JUNCTION OF U.S. HIGHWAY 211 AND SKYLINE DRIVE AT THORNTON GAP BY GOING SOUTH ON SKYLINE DRIVE FOR 3.9 MILES TO AZIMUTH MARK NO. 1 ON THE LEFT AT PINNACLE OVERLOOK. CONTINUE SOUTHERLY ON SKYLINE DRIVE FOR 5.85 MILES TO THE STATION SITE ON THE LEFT AS DESCRIBED ABOVE. REFERENCE MARK NO. 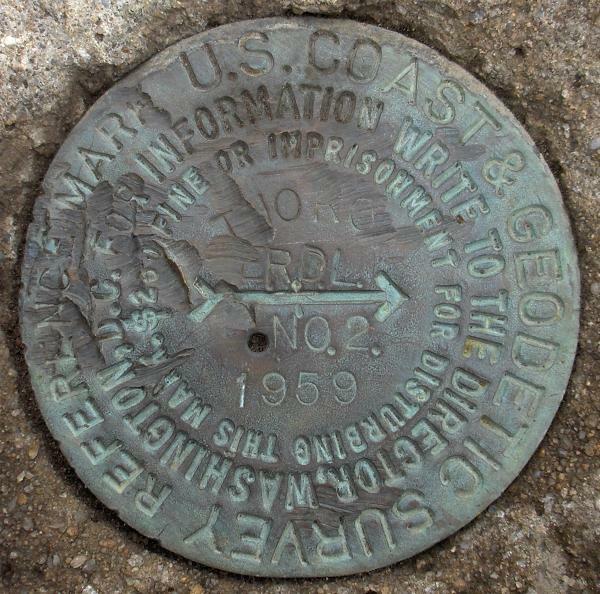 1 IS A STANDARD REFERENCE MARK DISC STAMPED, THORO ERDL NO 1 1959, IS SET IN A DRILL HOLE IN THE NORTHEAST CORNER OF A 2 BY 2 FOOT CONCRETE SLAB WHICH IS ABOUT 3 FOOT WEST OF THE ROCK GUARD WALL ON A WIDE BERM. AZIMUTH MARK NO. 2 IS ABOUT 500 FEET SOUTHWEST OF THE STATION, ON THE SOUTHSIDE OF SKYLINE DRIVE AND IS SET IN A DRILL HOLE IN OUTCROPPING BEDROCK. THE STANDARD AZIMUTH MARK DISC IS STAMPED, THORO ERDL 1959. REFERENCE MARK NO. 2 IS ABOUT 3 FEET WEST OF THE GUARD WALL ON THE WIDE BERM. 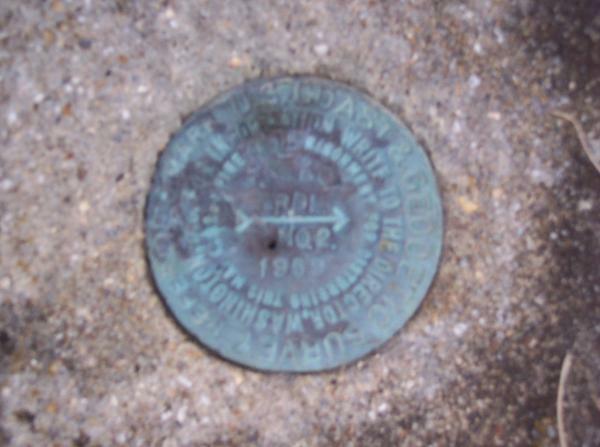 IT IS SET IN A 12 BY 12 INCH CONCRETE POST THAT PROJECTS ABOUT 4 INCHES AND THE STANDARD REFERENCE DISC IS STAMPED, THORO ERDL NO 2 1959. 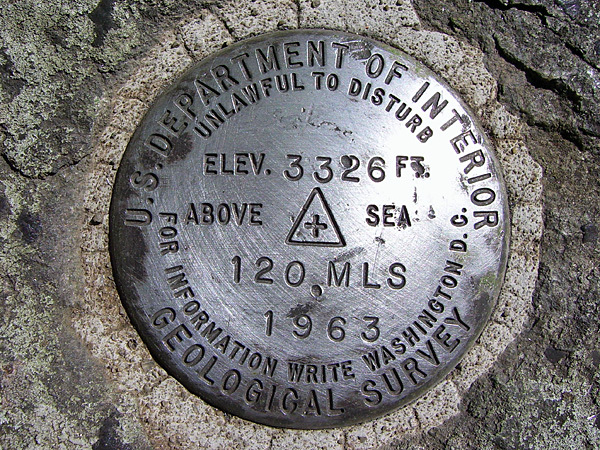 AZIMUTH MARK NO. 1 IS ABOUT 1-1/2 MILE NORTHEAST OF THE STATION AT PINNACLE OVERLOOK. 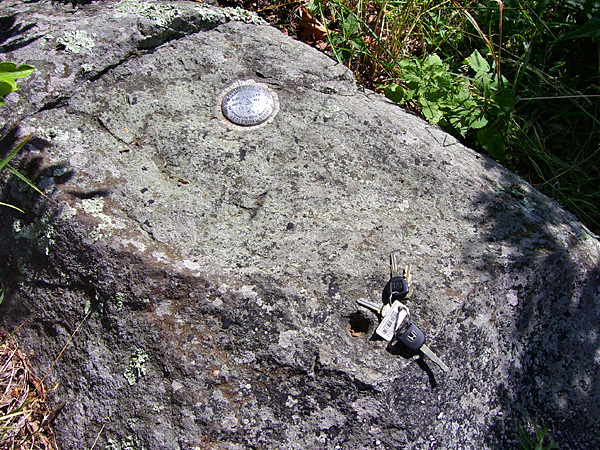 THE MARK, A STANDARD AZIMUTH MARK DISC, IS SET IN A DRILL HOLE IN OUTCROPPING BEDROCK, LOCATED IN THE SMALL ISLAND BETWEEN SKYLINE DRIVE AND THE ROCK GUARD WALL. THE DISC IS STAMPED, THORO ERDL 1959. HEIGHT OF LIGHT ABOVE STATION MARK 1 METERS. 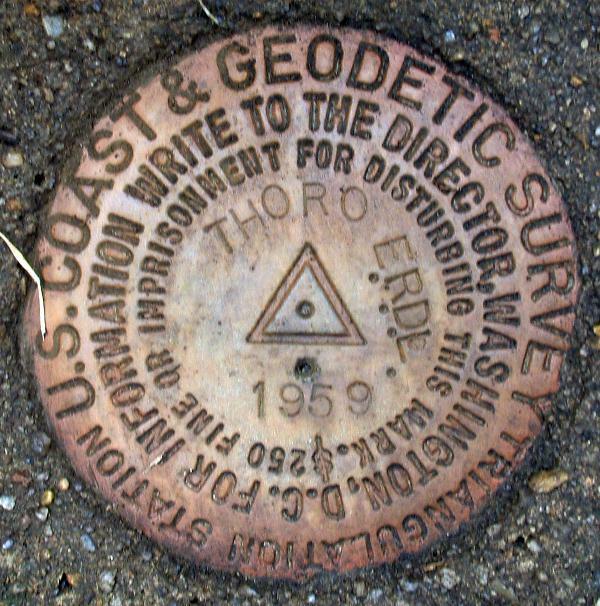 The horizontal coordinates were established by classical geodetic methods and adjusted by the National Geodetic Survey in November 1994.